Starting in May 2018 Pure Yoga will be offering an outstanding yoga teacher diploma course. It covers a total of 1200 hours over a period of 4 1/2 years and will end in October 2022. The course is led by Bruno Dietziker. Special guest lecturers will be invited to teach theme-specific portions of the training. 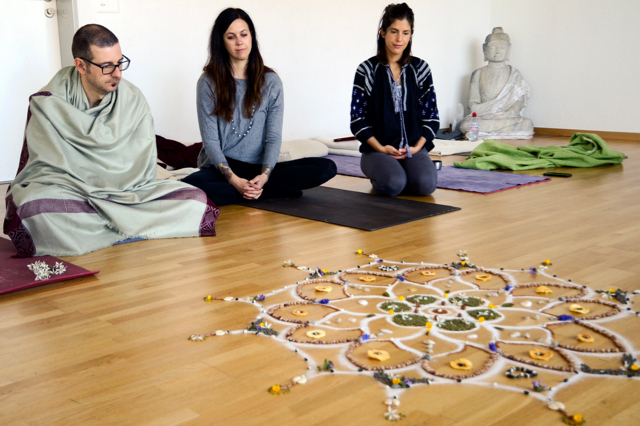 The course takes place on 8 weekends per year in the beautiful yoga studio ‘Yogazentrum am Weiher’ outside Zurich. An additional two weeks per year will be spent in training outside of Zurich in the magic ‘Felsentor’, an ideal and fabulous nature place of unique power, offering stunning views over the alps and lake lucerne! Fotos of the ‘Felsentor’ you can find here. Upon completion of the course, participants will submit a written dissertation. One of the main aims of this unique diploma course is the rediscovery, preservation and transmission of the true yogic tradition. Participants will have the opportunity to rediscover yoga as an art and science and acquire a wide knowledge of yoga upon completion of the course. The course content will be split approximately 50/50 between yoga theory and practice and will be taught in English and German. The study of various scriptures and ‘views of life’: Vedas, Upanishads, Bhagavad Gita, Patanjali’s Yoga-Sutras, Hatha-(Yoga)-Pradipika, Gheranda Samhita, Tantra as well as the ‘views of life’ known as Niaya, Vaisesika, Vedanta, Mimamsa, Yoga, Samkhya, Buddhism, Jainism, Charvak and the Kybalion. Asanas: correct alignment, use, applications and contraindications. Adjustments with hands-on! If you have any questions please don’t hesitate to contact Bruno Dietziker directly at +41 79 416 19 02 or use the contact form. He will be very happy to accomodate you!